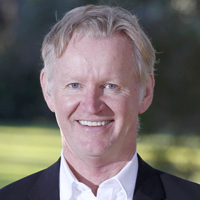 Nick is the Chief Executive Officer of the Australian Water Partnership and has over 40 years’ experience in the water and natural resource management sector. He has led 14 major research programs across Australia at the intersections of water, agriculture, forestry, mining, urbanisation, biodiversity and climate change. Nick has developed national policies and pioneered methods in research prioritisation, evaluation and futures analysis. Internationally, Nick has worked across Asia, Pacific, Africa, Europe and North America. Nick was formerly the inaugural Director of the Global Water Institute at the University of New South Wales, CEO of the International RiverFoundation, and CEO of the Western Australian Ministerial Water Resources Council. He has held senior positions in government, industry, consulting, academia and the not-for-profit sectors. Nick is a member of the Strategic Council of the International Water Association. Nick undertook his BSc (Hons) in Physics at Imperial College, London, a Doctor of Philosophy in Astrophysics at the University of York, UK, and a Postdoctoral Fellowship in Catchment Hydrology at the University of Leeds, UK. Nick is a Visiting Professorial Fellow at the University of NSW and a Fellow of the Royal Society (NSW).